Mrs. Wilberton wants us to do a project called The Environment, which is nature study really. Robert Granger lives next door, and he's always trying to walk home with me. Lucky I'm a fast walker. When Clarice Bean gets to school late for the second day in a row, she finds to her dismay that she's assigned to work with Robert Granger on the project. She's underwhelmed by his choice of subject--documenting the racing records of snails and worms--but when Clarice arrives home, an exciting cause is waiting for her. Her 'tweener brother Kurt arrives all hot and bothered about the city's plans to cut down everyone's favorite 100-year-old tree on Navarino Street. "I won't have any dinner because I am too depressed to chew!" Kurt says. Grandad switches off the television, so, of course, we know he's upset. Soon it's a family protest movement. Kurt and his friend Morten set up a tent, prepared to camp around the tree's base to prevent the cutting crew from having their way. Clarice and little brother Noah set out to make signs which read FREE THE TREE, Dad makes veggie spaghetti to feed the demonstrators on site, and Mom climbs right up in the lower branches of the famous tree. Even Robert is intrigued by the sudden eco-activity on Navarino Street. "Why is your brother camping, Clarice Bean? Is he on vacation?" he asks. I say, "No one takes a vacation on their own street, nitwit. They're having a protest!" The protest soon draws the media, and the local newspaper prepares an article with a dramatic photo of the FREE THE TREE protesters, under a banner headline TREE TO BE CHOPPED DOWN ON NAVARINO STREET. And when Clarice arrives for school the next day even later than usual, Mrs. Wilberton threatens to call her mother right away. Mrs. Wilberton wants to know why I am late again and where the Dickens is my snail and worm project. "We have been up 'til all hours saving the planet on our street," I say, "She can't get to the phone right now, Mrs. Wilberton, because she's up a tree." Mrs. Wilbertson says, "Right. That does it, young lady. We do not tolerate nonsense in this class!" But Robert Granger says, "But it's true, Mrs. Wilberton!" He shows her the picture from the paper. And that's the only time Robert Granger has been useful EVER! "I have been being an ecowarrior!" I say. Mrs. Wilberton's smile is a little tight at the edges. But of course she has to say "Well done, Clarice Bean." 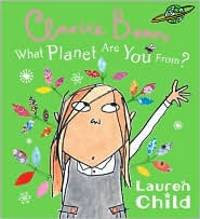 Lauren Child's Clarice Bean, What Planet Are You From? (Candlewick, 2010) has been niftily recycled in its first American paperback edition, with intriguing die-cut covers and Child's perky and popular Clarice Bean's frank asides and expressive face put to good use in a hometown eco-adventure just right for reading during Earth Day activities. The author offers plenty of ecological information along with her droll story of a heroine who is always in on the action, even if it takes her right up a tree.